Bandhani: A process of patterning cloth by tie-dyeing in which the design is reserved on the un-dyed cloth by tying small spots very tightly with thread to protect them from the dye. It is especially popular in Rajasthan and Gujarat. 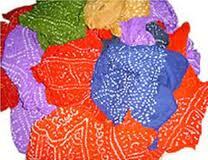 Cotton Bandhani is always tied and dyed on voile cotton, which is soft and easy-care. 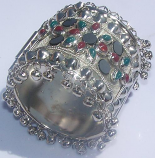 It is mostly used in saris, salwar kameezes, lehenga cholis, skirts and veils. Dry-cleaning is recommended. If hand washed, color may be slowly lost.